This is one of the very deepest looks into space we’ll ever see, and when you look at it in comparison to other deep space shots, it reveals something intriguing about our universe. 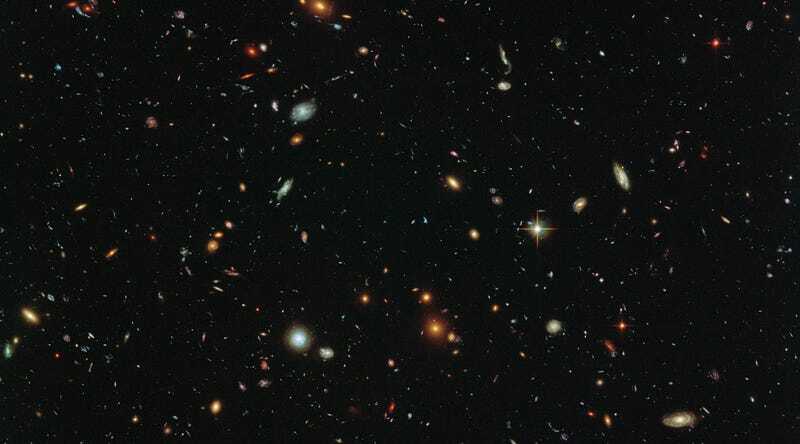 NASA and the ESA released this new deep field Hubble image today showing a section of space running almost precisely parallel to Abell 2744, the Hubble’s deepest space view ever. It’s not just a beautiful picture. The section’s parallel path makes it an ideal testing ground for researchers to compare how similar sections of deep space are—and that comparison could have big implications for what we think we know about deep space. The deeper we look into the universe, the more we depend on snapshot views. We see only tiny flashes across a few moments, and from those split-second views we try to extrapolate the facts about our universe at large. The truth is, though, that we don’t really know how much the tiny sliver represents the whole. So the question becomes whether what we’ve seen are simply random anomalies or if they’re revealing something larger about the universe. This image is part of a larger attempt at comparison, to not just look for the answers to our questions about the universe ever deeper into space, but also to look around the spaces we’ve already seen, to see what they tell us about what we already think we know about the universe.